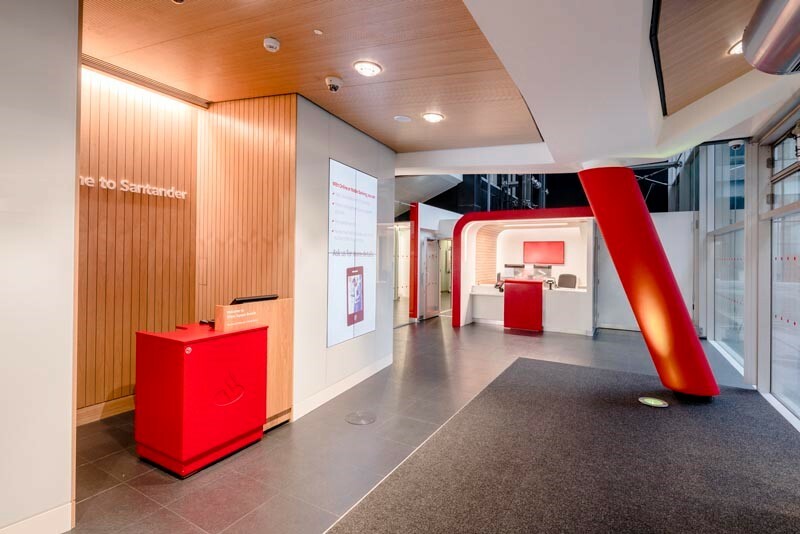 As part of a major project to create an open, inviting and distinctive retail banking branch within the new Santander UK London head office, Corian® high-tech surface has been chosen to enhance both the visual impact and the functional interface with clients. The six-storey atrium has been designed to establish a flowing and accessible use of its volume, with split levels and suspended elements framing the focus on a pair of living trees planted at the heart of the space. The interior scheme of the impressive glazed structure is aligned with various technical innovations intended to enrich the customer experience. These include improved digital banking access via tablets, a touchscreen booth and merchandising screens. The ‘shop front’ has been kept clear with only low level installations to maintain the visibility into the fully glazed space. 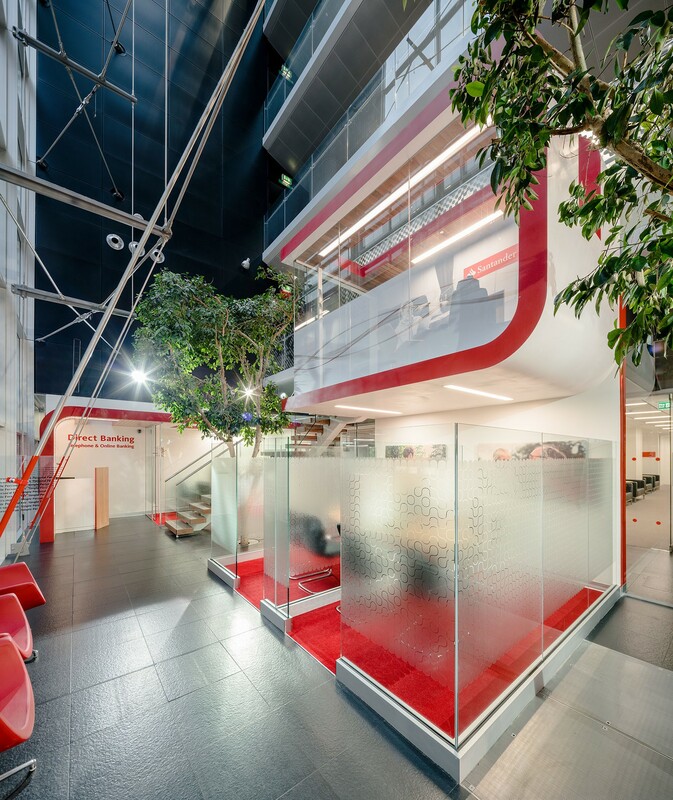 The Triton Square branch at the London head office of Santander UK features the premium finish of Corian® surfaces in in the Glacier White and Red Hot colours to align with the brand. The material forms service desks and cladding. Photo courtesy of Santander UK, all rights reserved. Echoing the brand’s characteristic colour themes, Corian® in Red Hot tone has been combined with Corian® in Glacier White colour to form smooth, seamless and curving surfaces that are welcoming to the touch while offering an enduring elegance. The skill and ingenuity with which Corian® can be fabricated has enabled design touches such as the engraving of the Santander logo into the vivid red fascia of the main service desk, which also offers sleek, seamless countertops in pristine white. The Triton Square branch at the London head office of Santander UK features the premium finish of Corian® surfaces in in the Glacier White and Red Hot colors to align with the brand. The material forms service desks and cladding. Photo courtesy of Santander UK, all rights reserved. 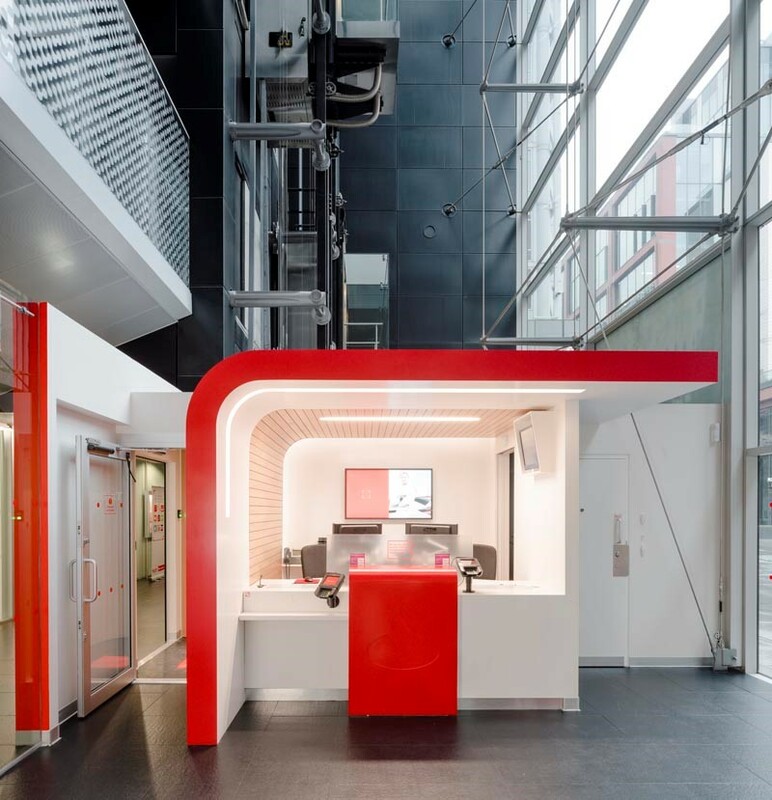 For added impact, Corian® in Red Hot tone has been used to trim the curving sweep of cladding that frames this service booth and other key zonal elements, thus co-ordinating the overall colour scheme while adding a touch of bold personality. The premium combination of sophistication, performance and proven reliability that sets Corian® apart from the crowd comes beautifully into play in this project. What’s more, the material’s cutting-edge compatibility with the latest technology offers added benefits for user-friendly surface installations, especially those that can expect high levels of public engagement. Further applications that maximise the easy adaptability of Corian® and its pleasing, hygienic tactility include the surrounds for the ATM units that are set into the Express Banking element. The Triton Square branch at the London head office of Santander UK has been designed to offer a light, open and flowing retail banking space, and features the premium finish of Corian® surfaces in colors to match the brand identity . Photo courtesy of Santander UK, all rights reserved. Naturally, the design of the space aims also for optimum energy-efficiency. Features such as underfloor heating and the apertures within the separation ‘planes’ of the various zones, which have been added to enhance ventilation, mean that no additional HVAC equipment was required, which together with the louvred ceiling that has been installed in the ‘back of house’ area will save approximately 40% of expected energy use otherwise.